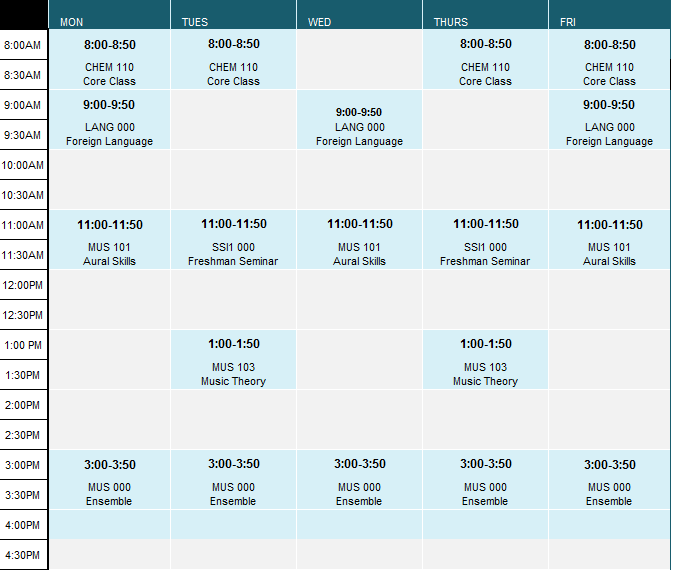 What does a typical class schedule look like? Here is one that provides a visualization of what a music student's course load may look like in the first semester. It will include a first-year seminar, music theory and aural skills (sight singing, dictation, ear training, keyboard harmony), foreign language, ensemble rehearsal, and an elective or course that satisfies a requirement in the university's core curriculum. If you place out of the foreign language proficiency requirement, you may choose to take another core course or an elective. Note: This is only a sample and may not be representative of an actual schedule. It also does not include private lessons, which are scheduled with your studio teacher. Students may only choose courses after meeting with an advisor. Please review the course descriptions page to see current course offerings and the two degree requirements pages to view courses required for the music major and minor.